An Alabama native, Mark Barron was born on October 27, 1989, in Mobile. The NFL star was raised in both his hometown and Prichard. While details regarding his early life and family members have not been made public knowledge, we do have some of his academic records. Barron’s athletic inclinations were evident from a very young age as he was active in various sports including football as well as track and field. From his high school days at St. Paul Episcopal, Barron exhibited his athletic prowess in both sports and won several titles with the school’s team such that he was ranked a five-star prospect after graduation. Barron continued with his outstanding field performances at the University of Alabama where he played for the Crimson Tide football team. At Alabama, Barron played college football as an extremely productive safety for two years before opting to play for the NFL in 2012. His golden chance for the professional play came that same year when he was drafted in the first round as the 7th overall pick by the Tampa Bay Buccaneers. Given how productive Barron was at Alabama’s powerhouse defense, there were great expectations of him in the NFL. However, he seemed to be floundering in Tampa Bay. During his almost two and a half seasons with the Buccaneers, the talented player was still productive but seemed like he was placed in the wrong position. It wasn’t long before the Los Angeles Rams noticed that Mark was an underachieving defense with the Buccaneers and quickly traded him for other undisclosed draft picks. The Ram’s prompt decision is apparently paying off as things suddenly picked up for Barron since he joined the NFL side. As a converted safety, Mark has dynamically transitioned from safety to an outside linebacker and then to an inside linebacker. Barron is now proving himself worthy of his draft pick in the Rams defense. It’s safe to expect that things will only get better for Barron as he appears to be a very valuable player the Rams can’t afford to lose…at least not yet. Barron is arguably not the best nor the most expensive linebacker in the league, though he may be nursing hopes of getting there someday. The talented player has so far earned himself a modest financial portfolio from his career. His current contract with the Rams was signed back in 2016 when he was handed a 5-year, $45-million dollar deal with $20 million guaranteed. 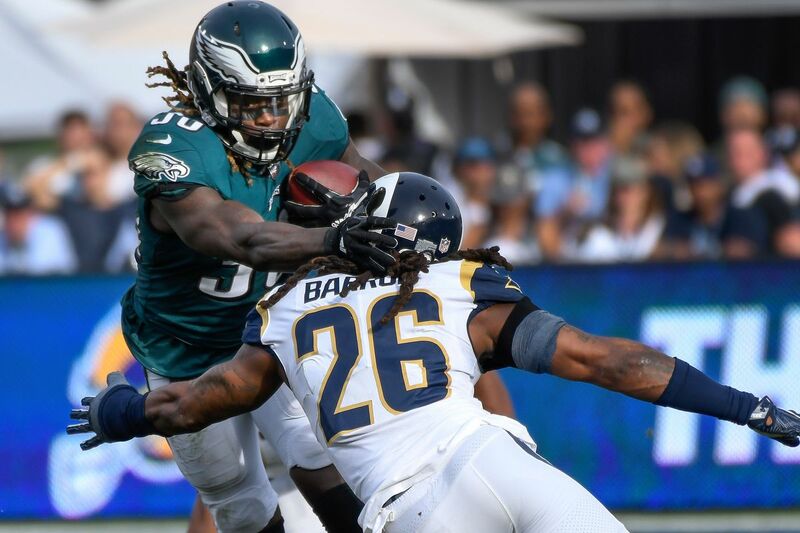 Before redefining his future as a linebacker with the Rams, Mark Barron was a safety, a defensive position that requires a solid build and Mark does not fall short of the expectations. The talented Rams LB towers at a height of 6 feet 2 inches, complemented by a weight of 230 pounds. Barron has accomplished quite a lot so far in his life and career. As expected, he has been recognized for his unique skills and dedication to the sport. Notably, some of his achievements date back to high school where he was an outstanding running back for a Class 5A state championship, was named the MVP as well as a first-team Alabama Sports Writers Association All-State selection. In college, the former University of Alabama safety was also named first-team All-American twice in 2010 and 2011. More so from 2009 to 2011, he was awarded first-team All-SEC thrice. Mark Barron is a dedicated philanthropist who has at various opportunities given back to the community especially his hometown. The former St. Paul’s and Alabama star whose whole career motivation and success came from Mobile, has not only volunteered on quite a few charity projects but has also mentored youths and rising football stars in his community. Notably, some of his good deeds include his football workout facility in Port City and an outreach project in collaboration with former teammate Chris Rogers’ non-profit ventures, ‘Together Assisting People’.